From the "seven times fall over, eight times rise up" Daruma tradition, the "Daruma Festival" was conceived of in hopes of reviving the town. 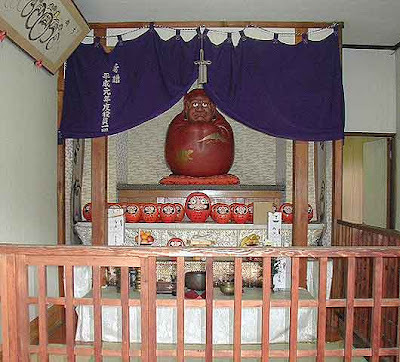 The first of these festivals was held as the Maizuru Daruma Festival around November 1, 1948. Many events are held at this festival, including parades and stage performances. The festival is held with this hall at its center, but it is close to the shopping mall of East Maizuru. One small Daruma is added each year, so they represent the number of festivals held since it started. 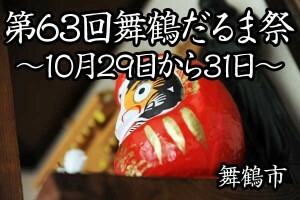 On the night before the festival, there is a large "Night Market" where people can buy Daruma dolls and many other things. 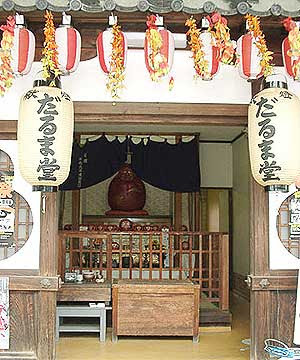 The autumn festival was held at the same time at the shrine Shira-ito-hama Jinja 白絲濱（白糸浜）神社, but now they are on different days to give people time to participate in both. Maizuru's development was greatly spurred after the naval port was installed in 1901. In the Russo-Japanese War, many warships were based there, due to its proximity to the Sea of Japan. After the Second World War, Maizuru was a key port for returning Japanese servicemen and detainees from continental Asia for over 13 years. Today, Maizuru is a key district headquarters for the Japan Maritime Self-Defense Force.